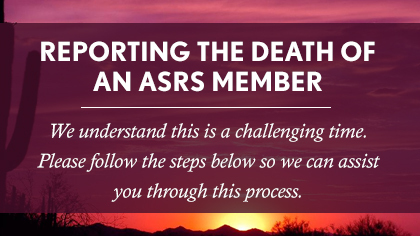 Need to report the death of an ASRS Member? Please accept our condolences on the loss of your loved one, and trust that the ASRS will do everything they can to make the survivor benefit payment process as seamless and timely as possible. The first step is to report the death to us, so that we can begin the process as soon as possible. Please call the ASRS directly at (800) 621-3778 and, when prompted, press two (2) for the "Not a Member" option. A senior benefit advisor will walk you through the short, simple process. Please note that the ASRS call center is open during regular business hours, Arizona time. See our contact us page for more details. Once you have reported the death, the ASRS will take the necessary steps to verify the member's death, audit the member's account, determine who to pay and how much to pay out. The ASRS pays survivor benefits based on member elections and state statutes. For security purposes, the ASRS staff cannot tell you over the phone who the member designated as their beneficiary(ies) or how much will be paid out. How much will a beneficiary receive in survivor benefits? At the minimum, the ASRS disburses all contributions remaining on the deceased member's account, including both member and employer contributions and earned interest, to the designated beneficiary(ies). At retirement, a member may have alternately elected to leave a lifetime survivor benefit to a designated beneficiary. Once the death is reported, the ASRS will calculate the benefits and notify eligible beneficiaries. For more information, see our Survivor Benefits page for members.